We usually eat a random assortment of items at lunch. Usually a big salad, maybe some fruit, some eggs or chicken, and then one other thing. Here are some of the “other things” I’ve made lately. 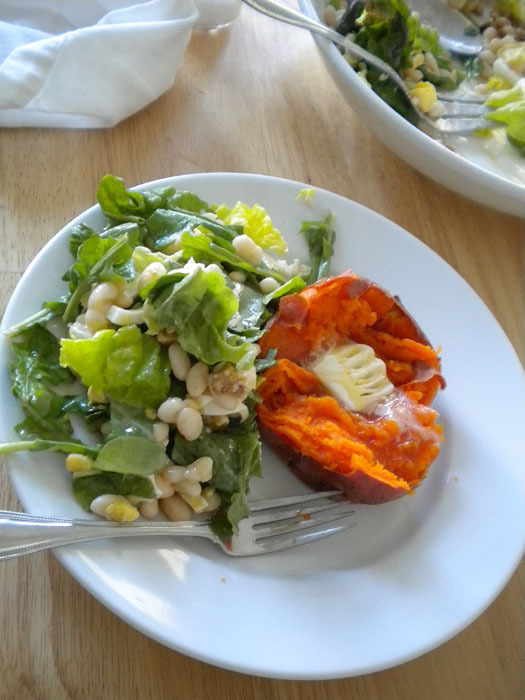 Baked sweet potatoes are easy and delicious. Just wash them, prick them with a fork, wrap them in aluminum foil, and bake them at 400 degrees. They take at least an hour, depending on how big they are (start checking them after an hour- they’re done when they are soft and easy to squeeze). They get very sweet and soft this way. You can serve them either plain, or with butter, or with butter and honey. Yum! 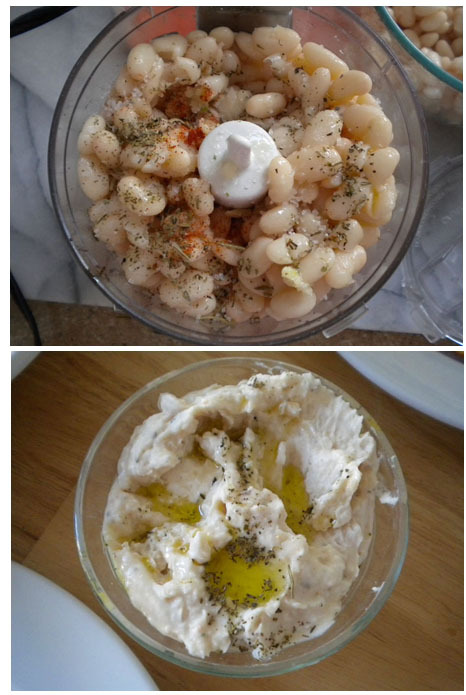 White bean hummus is another easy and tasty treat. Take a can of white beans (great northerns work better than cannellini beans do) and put it in a food processor with a clove of garlic (you might need to mince or press it first), a couple swirl of olive oil (start with a smallish amount and add more as needed to make the hummus smooth), some salt, some dried herbs ( I usually use an Italian mix but whatever you use should include rosemary), some paprika, and some lemon juice. Whirl it all together till it’s smooth, adjust the seasonings, then serve with a swirl of olive oil on top and some pita triangles along side. I didn’t put any amounts in this recipe because each person has their own taste- so you should do it according to yours. 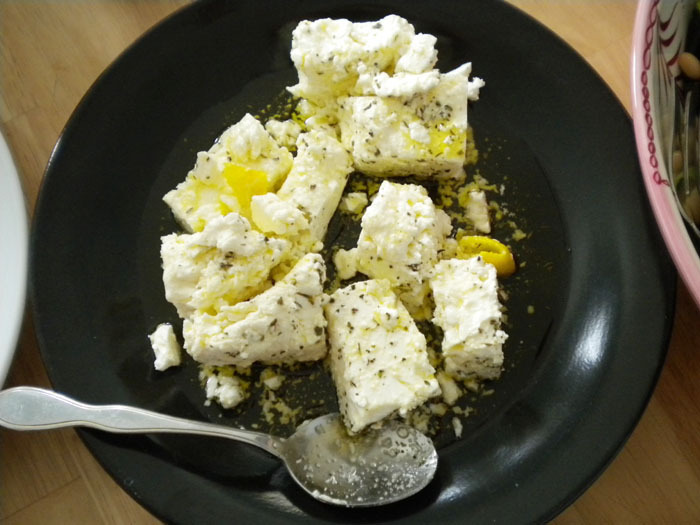 Tzatziki is yet another easy thing to make. Mix together some plain yogurt, some lemon juice or red wine vinegar, some dried dill, some garlic, and some chopped up cucumbers. If you have the time, dump the mixture into a coffee filter lined strainer over a big bowl and let the liquid whey from the yogurt drain out. It gets extra thick and creamy that way. It will take anywhere from 15 minute to an hour, depending on how thick you want it. I like to serve this with toasted pita triangles: cut pita into triangles, put them on a cookie sheet, drizzle them with oilive oil and bake them in the oven at about 350 degrees for maybe 10 minutes. Keep an eye on them and turn them part way through so they cook evenly. Fancy olives also go well with the tzatziki and pita. 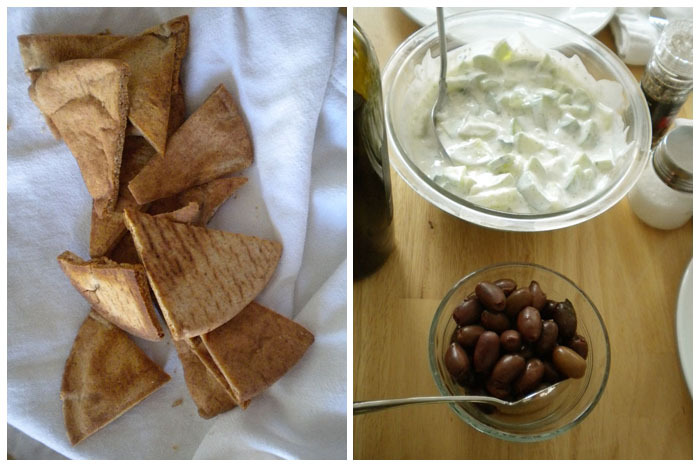 Tzatziki with baked pita crisps and olives. Quesadillas are easy and can be made with pretty much whatever you have on hand. 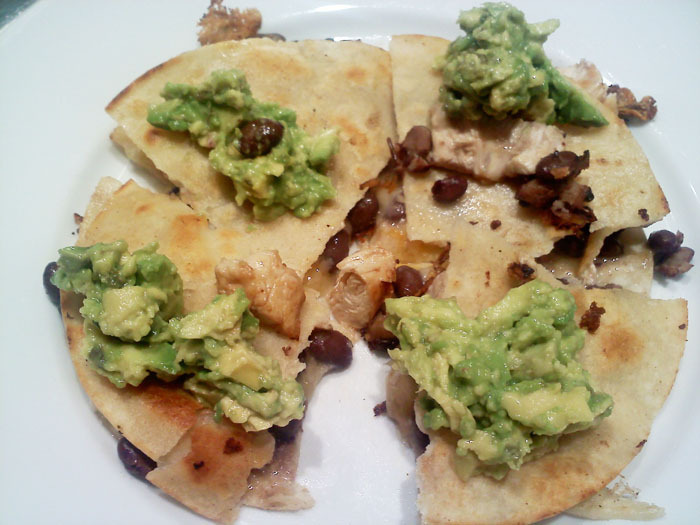 These were chicken, cheddar, black bean, and avocado. 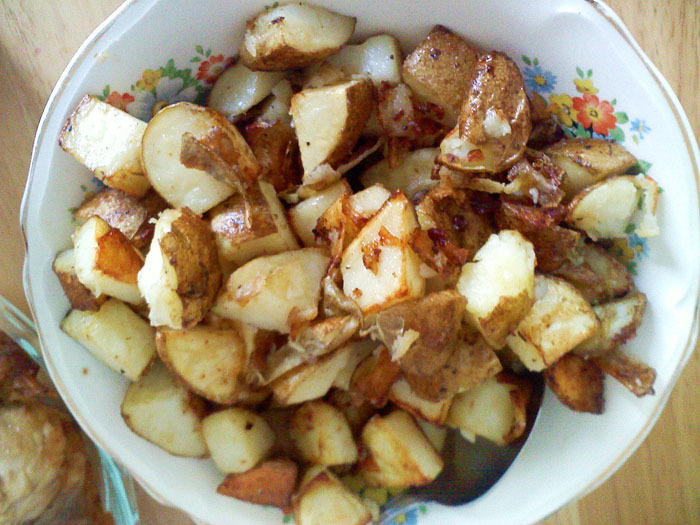 I make these food posts to give you some ideas for inexpensive, easy, and healthy meals. Not so much as a recipe guide. But as always, if you want more info on anything, just leave me a note in the comments.